Zurich, Switzerland – 11 July 2013 – Perspectives Software Solutions announced the release of JustResizeIt! + 2.0 based on the innovations of JustResizeIt!. By adding sending capabilities, pictures are automatically resized and sent to a group of email addresses or uploaded to an online gallery controlled by the user. Private sharing of pictures is simplified to a single drag & drop. JustResizeIt! introduced back in 2009 one of the most simplest way to resize pictures. The user creates widgets that define how the images will be resized, drag and drops one or more images on a widget, waits a few seconds and drag and drops the resized images from the widget into an email, office document or a folder. 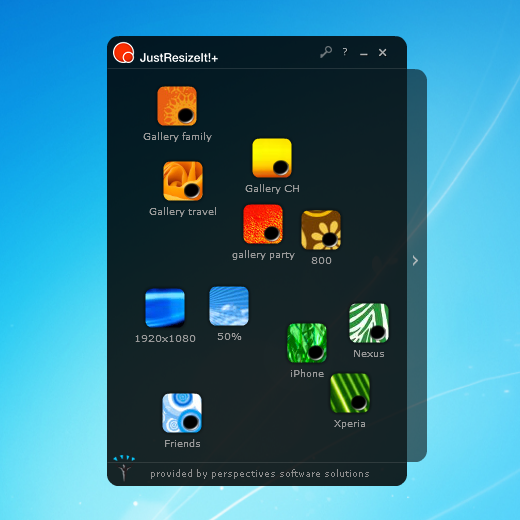 The new JustResizeIt!+ 2.0 release has sending features added to the resizing.